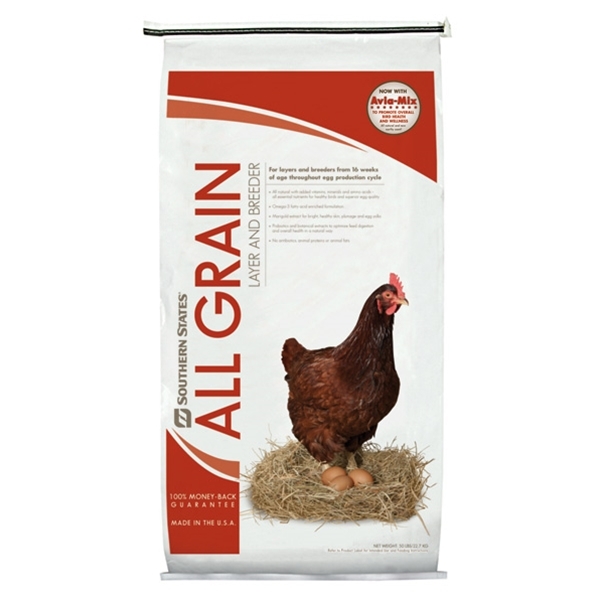 Southern States All Grain Layer & Breeder Pellet is a complete vegetarian feed that is ideal for egg layers and breeders 16 weeks of age and up. The nutrient dense, all-natural formulation results in eggs produced with higher levels of vitamins, minerals, and omega 3 content, and superior egg shell and yolk quality. The added pro-biotic optimizes feed digestion and overall heath in a natural way. Southern States All Grain Layer & Breeder Pellet is free of antibiotics, animal proteins and animal fats. Avia-Mix Wellness Technology. Naturally promoting poultry health and performance. A specific blend of essential oils and plant extracts which improves digestion and reduces the incidence of coccidiosis. All natural with added vitamins, minerals and amino acids. Contains no antibiotics, animal proteins or animal fats. All the essential nutrients for healthy birds and nutritious eggs. Flaxseed added. Omega-3 fatty acid enriched formulation. Eggs produced are high in Omega-3 fatty acid content. Marigold extract. Provides for bright, healthy skin, plumage and egg yolks. Probiotics added. Beneficial bacteria which supports overall digestive health. Balanced ratios of calcium, phosphorus and manganese. Provides superior egg shell quality. A 16% protein complete feed for poultry layers and breeders. Can be recommended for various poultry species such as: chickens, waterfowl, hobby and specialty breeds. Feed ALL GRAIN LAYER AND BREEDER free choice to brown and white egg layers and breeders when hens reach 16 weeks of age. Provide fresh feed, water and oyster shells to hens on a daily basis. Feed ALL GRAIN LAYER AND BREEDER free choice to brown and white egg layers and breeders when hens reach 16 weeks of age. Provide fresh feed, water and oyster shells to hens on a daily basis.